What is a hammered dulcimer? 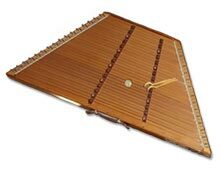 Technically, it is a cousin of the zither, played by striking the strings with small hammers. Perhaps a better answer is to say that, once you've heard one played, it becomes unforgettable! The hammered dulcimer is easy to learn, wonderful to play on your own, and “plays well with others,” blending in easily with most other musical instruments. It is the perfect instrument for American folk or Celtic music. And, if you purchase your hammered dulcimer from Pinelands Folk Music Center, a series of beginning lessons is included with your purchase. Hammered dulcimers are available in several sizes, depending on the number of strings. We carry small hammered dulcimers, ideal for beginners, right on up through full size and extended range instruments for more advanced players. We don't just sell the instrument — we will help you select exactly the right one for your own style and level of play, and assist in the purchase of related supplies such as a stand or extra hammers. Rich teaches both beginning and intermediate hammered dulcimer, and we carry instructional books and CDs, too. Whether hearing a hammered dulcimer has left an indelible impression — or you are curious about this beautiful instrument — take a few minutes to stop in. You are always welcome to try one out, or listen to Rich play. Either way, you, too, will be a fan for life!